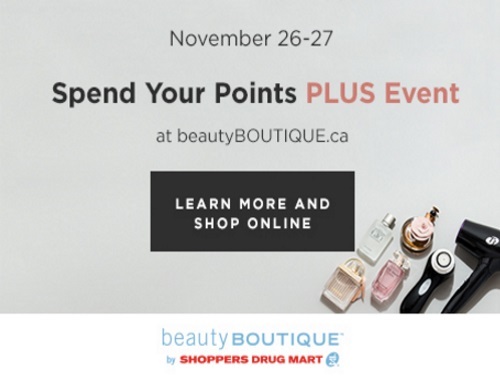 Along with Shoppers Drug Mart's Spend Your Points Plus Event the BeautyBoutique also has the same offer! The $20 worth of points back on 50,000 points level redeemed is equivalent to 16,000 Shoppers Optimum Points. The $40 worth of points back on 95,000 points level redeemed is equivalent to 30,000 Shoppers Optimum Points. Shoppers Optimum Points will be awarded by December 19, 2016. Offer is valid November 26-27, 2016.